The following article is written by our very own Randy Watson, Moderator of the Night Hunting Forum. 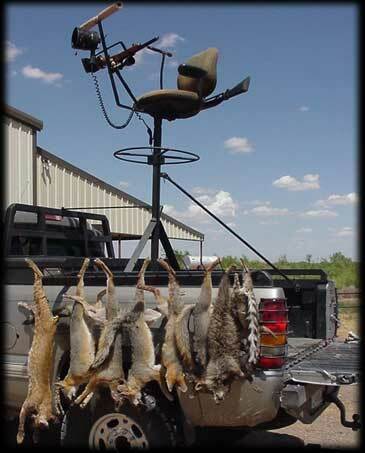 Randy is a guide/outfitter that hails from Midland, Texas and owner of Varmint Masters Guide Service. This article is also being reprinted with permission from The Trapper and Predator Caller Magazine which first appeared in the February, 2002 issue. Our thanks to The Trapper and Predator Caller! We were both huffing and puffing when we finally got to a rise in the darkness that seemed like a good vantage point. It was hard to tell, judging only by feel. It was two in the morning, we had been poked by mesquite thorns and stumbled along in the night for better than a half hour. We could finally relieve our aching arms from the load. The load of a heavy car battery carried in an old metal milk crate that drained our arms strength while the other arm was busy carrying an old twelve-volt spotlight and a twenty-two rifle. 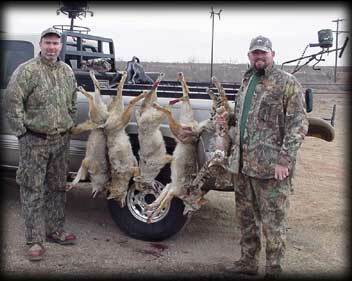 We had been pretty lucky at calling coyotes in the daylight hours, but knew the night hunt would produce a truckload. After all, there was a ten-dollar bounty and at the ripe old age of thirteen, we knew after one night, we would be pretty much set for life. After a few minutes of catching our breath, all the while attempting to hook up our makeshift spotlight, I mustered enough breath to let out a squall on the Burnham brothers long-range predator call. I had saved my money and ordered the predator combo, which consisted of a long-range call and a cottontail squeaker. They had been responsible for the death of many a wary coyote. The silence of the darkness was broken by a blood-curdling cry of a Jackrabbit having his toenails pulled out. After many years of rabbit hunting in West Texas, I had a good idea on how to imitate the most excruciating cry of a big 'ol Jack. As the resilience of the first squall was fading, we sat there in total darkness. Feeling some apprehension and a lot of excitement, I continued to send out the sounds of an easy meal to any unsuspecting critter within earshot. My buddy and I looked at each other through eyes the size of silver dollars when we heard a growl that sounded close enough to be one of our stomachs. As he scrambled to find the switch on the light, the hair on the back of our necks stood up like porcupine quills. The light switched on, and there in front of us, not twenty feet away, was a huge set of eyes staring at us like we were dinner. Before I could get the gun up, out of self-defense, he panned the light three hundred and sixty degrees, to see what appeared to be a string of Christmas tree lights that had us surrounded! Good news was that I was brandishing an old Marlin automatic twenty-two with lots of bullets. I'd like to tell you I shot with pinpoint accuracy and stacked up coyotes like cord wood, but the truth is, I found myself pulling the trigger on an empty chamber after thirteen shots left the barrel in all directions into the night. I had seen John Wayne take on an insurmountable number of Indians that Saturday morning, but there is no way he was as scared as these two kids running for their life, still packing the now weightless milk carton and battery, yelling and crashing through mesquite at a rate that would have made Jessie Owens proud. Somehow we cleared the fence with all of our gear and were now safely out of the brush. We heard loud thumping that turned out to be our hearts attempting to jump out of our chests. We stood there, scratched and bleeding as our fear turned to laughter. I was hooked! That was no doubt the most exhilarating feeling I had ever had, and I knew I would do that again, hopefully with different results. This started a life-long quest of the night and the animals that hunt the night. Luckily, I've learned a thing or two since. I was quite successful in the early years on the ground getting coyotes, fox, and an occasional Bobcat close enough to take with my twenty-two. As time went on, and I got a pick-up, things started to get better for me and not so good for the varmint population. The twenty-two graduated to a magnum, then a hornet, and eventually a two twenty three bull barrel that has led to the demise of literally thousands of unsuspecting predators. Drivers license put a new spin on night hunting. While all my buddies were out partying, chasing girls or whatever, I was out dealing misery to the local varmint population. I hunted from the back of the truck, then the top of the truck shining a white light and blowing on a call for hours. As I grew up, my passion for the sport was fueled by fur prices going through the roof, allowing me to now actually justify this madness to my Father. I'll share with you folks, for what it's worth, some of the tricks of the trade of this wild and exciting game. I've made enough mistakes over the last thirty-four years to learn a bit about what it takes to successfully put a few critters in the back of the truck. First of all, the light is the key to having a successful night hunt. A sub-standard light will make a sometimes-challenging process become extremely difficult. Predator's eyes are unique in that they collect and reflect light through a series of cones, bars and stuff that I really don't understand. This characteristic make the little buggers eyes shine like reflectors when hit with a light at night. Now, shining a white (clear) light seems pretty easy, and, granted, it does make things easy to see, but varmints don't seem to be compelled to "walk toward the light", like the poltergeist girl. A clear light will usually spook a coyote long before you can get a shot. The remedy for this problem is a red lens. The red lens, or filter, makes the harsh bright light a soft, red, less intimidating glow, which will illuminate the eyes even better. The red lens allows the caller to detect an in-coming predator at distances of over five hundred yards. The trick is, to keep the light high and just above the predator, while he approaches. This is especially important with coyotes. For some reason, foxes and cats don't seem to mind the light as much. Some areas where coyotes have seen a lot of night hunting, they can become "light shy". It may be necessary to have a dimmer control to turn the light down a bit, making the glare not quite so intense. This makes the eyes a bit more difficult to see, but it may allow shy dogs to come close enough for a shot. Some people like to hit them with a clear light when ready for a shot, but I've found it much better not to change anything at that crucial moment. You should learn to call in and shoot with the red light. Brand names don't much matter, but anything from a two hundred thousand-candle power to a million candlepower works really well for us. I'll talk more about the use of the light later. Whatever mouth calls you are accustom to using in the daytime in your area should work fine at night. A howler can be used in some cases, but a distress call has always seemed to be the best bet. Electronics can be used, as long as you keep the caller at or close to your vehicle. The predator needs to be looking in your direction in order to reflect the light, enabling you to see him. A remote caller, away from the light will have him looking in the direction of the sound, and you may not be able to see him. It's also a good idea to have a squeaker handy, or be able to smooch, or lip squeak. Some varmints will come in and hold up a little. The squeaking will usually bring them right on in. 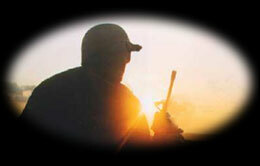 The evolution of the light and the calling equipment is really a major advancement to the sport of night calling. I think the greatest adaptation is the use and perfection of what we call "The Chair". After years of having to hold the light still, while getting the crosshairs on 'em, and squeakin' a little, I decided there had to be a better way. 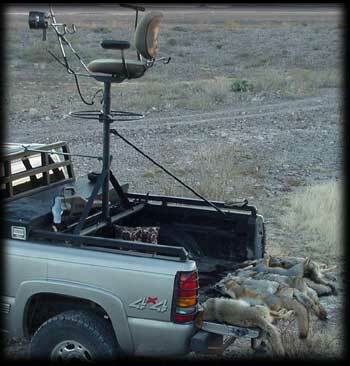 I got out in my shop and started fooling around with some ideas on how to make a calling, spotlighting, shooting, hunting, and riding stand up in the back of a pick-up. I needed one that was able to hold the light for me, give me a good stable rest from which to shoot, a steady and safe place to ride as well as a good viewpoint as I called. What I have come up with is a multi-function chair with more amenities than your lazy boy. I used a nice office chair and on the bottom of it, built a metal plate to accommodate a shaft that would go into a cylinder for three hundred and sixty degree maneuverability. Next, it had to be stable enough to hold a big fellow through the sometimes-rough terrain of the rocks, hills, and wash outs around the local area. I secured it to my truck by attaching it to the angle iron rails down the back of the truck. After a couple of braces and a little welding, the chair took the form of something just short of "Road Warrior". Shooting a heavy varmint barrel rifle, I wanted to be able to support the weight of the gun, as well as having a place to put the gun when the terrain gets a little hairy, or I just flat get lazy. I came up from the bottom of the chair with a bar and crossed the top of it with another bar for a shooting rest, onto which I built a gun rack. I needed it to securely hold a spotlight in the direction in which I was looking and shooting, so I mounted a light on the front of the bar that supports my gun. As I had learned from many hard charging foxes, and a few coyotes, you sometimes need a shotgun. So, I built a small rack behind the chair for a shotgun. My feet rest on a circular support to allow me to turn the chair with my feet, so I can keep my arms free. I stuck a walkie-talkie up there to be able to communicate with the driver and added a higher armrest on the right for stabilizing the rifle. The whole set up got me off the ground about twelve feet. 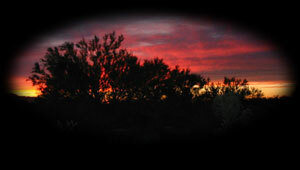 This makes for a very good vantage point to see over the tops of mesquites and brush. With all this great equipment available, it should be simple, right? Well, you still need to know a few things about night hunting that are real contrast from day hunting. Finding an area with a good field of view is a good idea. After all, if you can easily look in all directions, by simply turning the chair, why not try to find a place where you can take advantage of that? We usually hunt to the first stand. This meaning we roll along (slowly) and try to spot eyes that are simply at the wrong place at the wrong time. When this happens, I hit the button on the radio, alerting my partner to stop. I then squeak until the critter comes in. We have taken many Bobcats like this. Once we reach the area we want to call, I always take a look around just in case one is looking at me close enough to see. A loud call right off the bat will sometimes scare off a close-by critter. If I see nothing, we begin to call. Just like with day calling, start easy and low volume, then graduate slowly to a full-blown calling session. As you call, turn slowly and pan the red light high, right above the tops of the brush. When you see a set of eyes, KEEP THE LIGHT ON THE ANIMAL, but do not directly shine the center of the light on the animal. Point the center just over the top of the eyes. We call this having them in a "halo". You will be able to see the eyes just fine, as they are very reflective. It is of the utmost importance that you properly identify your incoming visitor as a predator. Just because you are blowing or playing a call that attracts predators, that doesn't mean that only predators could come in. I've had many deer, dogs, house cats, pigs, and even a few calves come to the call. Trust me, you don't need that kind of aggravation. Once you have positively determined your guest, remember to leave the "halo" on him. The same thing that makes him a night hunter, gives him the ability to see your vehicle unless the light is on him. The brighter the night, the more important this is. If he gets close and you move the light he will most likely see what's up and be gone. The downside of night calling is that if they turn away and bug out, you usually don't get a shot like you sometimes do in the day. Once the critter is in your range or close enough that you want to take him, squeak, smooch, bark or do whatever necessary to stop him for the shot. I've actually had fox get under the truck while focusing on another one, or just because he wasn't stopping. Thus, the shotgun mounted right behind me. Getting used to this whole night thing is fun and a bit challenging, but the rewards can be many. We've had nights when we took over twenty coyotes, and one when we bagged six Bobcats, four Fox, three Coyotes and three Raccoons. Most nights we take several different animals. That's part of the fun; you never know what might come in. The action is sometimes intense, with multiple responses, hard charging Coyotes, or maybe a big 'ol cat sneaking in on you for a kill. If you haven't tried night calling, give it a try, you may be pleasantly surprised. Good Hunting.